A new approach of an original painting. The original didn’t work out for me. It looked contrived. I decided to attack it with intense colors, and painted out the clouds. I let that dry, and then proceeded to work from the horizon upwards into the sky section. The next morning, I took a palette knife to what I’d done the day before. I loved the color revealing itself from beneath. I followed the instructions from the painting, and developed the sky from that premise. The gestural clouds filled in, and I had a painting. Quite unlike anything I’d done before, and that’s a good thing. Continuing our Greek God theme, I have titled this piece with a double meaning: as both a primeval and visceral experience of the awe of Nature; and a threshold, an opening or beginning. It is when we have become at one, submerged, baptized and connected with the invigorating depths, that we may actually find ourselves...even healing for these uneasy times. I don’t know why, but it was unavoidable to title this piece after the Greek god of the oceans. Perhaps it was the light and power, the primal force, Nature confronting the viewer on its own terms. 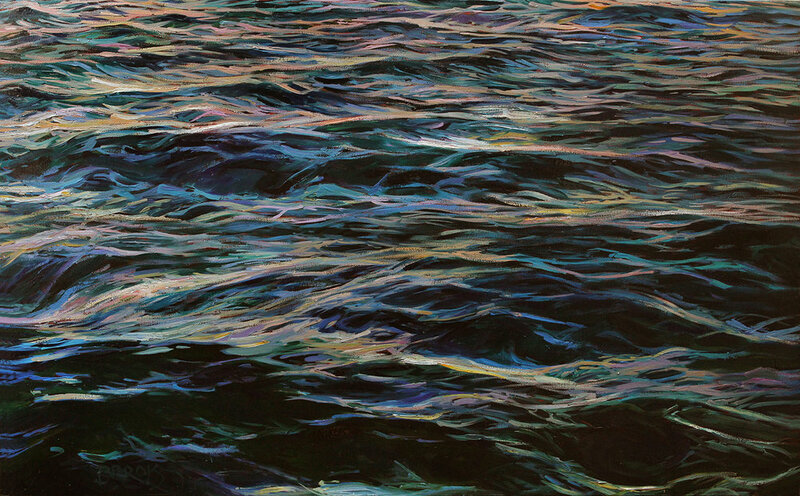 A first in a series of water/ocean surface paintings. It’s a whole new seascape for me, for anyone — take out the bluffs, the boats, the horizon, the usual ingredients that can make up a typical seascape. What do you have left? The element of Water. The Sacramento Delta region of central California is a world unto its own. Couple that with the Dutch landscape tradition of the 17th Century. That’s what I explored in this series of intimate paintings of Old World light: quiet and luminous, poetic and timeless. Sometimes it’s not about detail anymore. 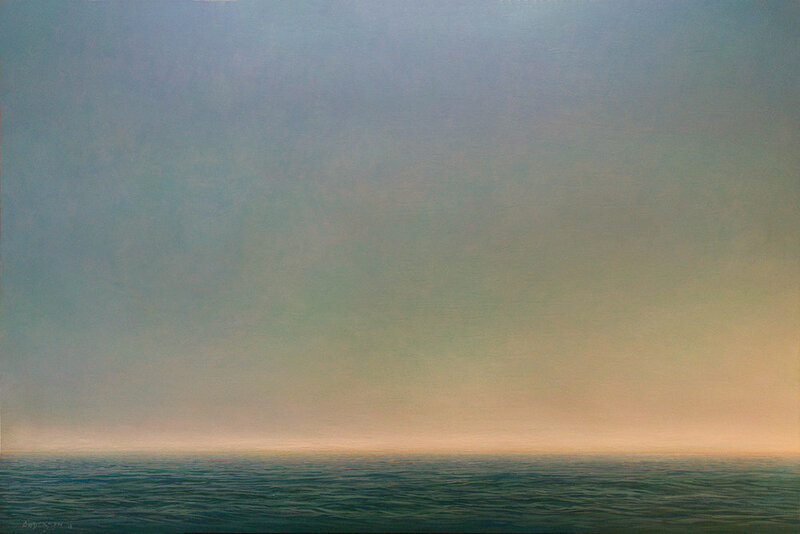 After mastering seascapes for years, it was time to allow the sea and sky to master me. It took me to the edge — nothing but the elements of water and air, horizon and infinity. There is nothing quite like the deep red and golden hues of sun-splashed high cliff walls over the rich greens of a churning west coast ocean! This particular stretch of the Oregon Coast is my favorite - inasmuch as I deeply identify with the power, drama, majesty, solidity, and spiritually commanding display of these monumental sea stacks. Pure color, vibrancy of brushstroke, strong composition, cool colors contrasted with warm — it’s all here in this painting. What began as a Luminist style painting of a tidal marsh in Hingham, Massachusetts, on the South Shore of Boston, turned into a full-fledged recreation of Nature itself - an emotive experience, a truly deep feeling of heaven and earth displayed on the stage of a coastal marsh. There is a suggestion of a Frederick Church painting here. Something heroic, operatic, tranquil - yet, engaging in a moment. It’s entitled “inlet” as an opening, a corridor to enter. The fifth in a series of water/ocean surface paintings. It’s a whole new seascape for me, for anyone — take out the bluffs, the boats, the horizon, the usual ingredients that can make up a typical seascape. What do you have left? The element of Water. Structure, light and luminosity, depth, theme and variation, push and pull, strong subject matter, and an excavation into the deeper realm of the unseen meeting with the seen, has always been an abiding drive for me to paint. I was lucky enough to have all those elements in this piece from the Mendocino Coast come from what was on my easel. The challenge to paint in extreme detail, juxtaposed with my absolute and abiding love for the coast, makes for a great opportunity to take up that standard, and to go back to my roots of painting with this in mind: making tiny flecks of light believable, a smoothness of transition of water current surface, and the placement of darker valued shapes communing with one another. Once in a blue moon, a painting comes along that allows you to just sit and stare at it after it’s completed. I sat on my couch for a while, taking it all in. I gave it a Greek water god name. I rather liked it. One must confront the breaking wave, embraced by the salt, the power, the depth, the gift from the immensity. Some of the most spectacular sections of the Oregon Coast belong to the first twenty miles north of California, along the Oregon Coast Trail, specifically known as the Boardman State Scenic Corridor. The soft and misty coastal light is unlike anywhere else. This particular painting presents a horizontal narrative of left to right night yielding to day - dark and cool leading into warmth and light.